Exploring Nagarjun Hill Day Tour is just amazing. Nagarjun hill day hiking tour is one of the most demanding day hiking route located near Kathmandu. Nagarjuna hiking tour is a single day tour and one of the finest hiking destinations near Thamel. The top elevation of Nagarjuna hill station is 2,128m/6,980ft, located about 7 kilometers west of the main city ofKathmandu city. The hill station is famous for its dazzling location and the influential Buddhist stupa at its crown. The glowing view of Manaslu, Ganesh and Langtang range is another major attraction of the trip. The hill is accessible by motor road as well which takes about 45 minutes. 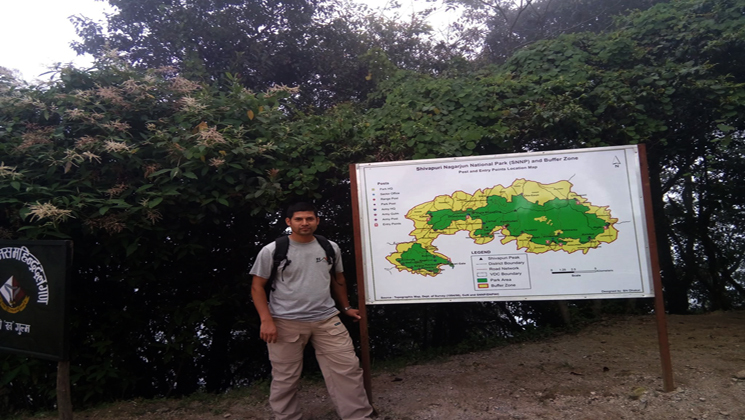 The total journey is 5 kilometers and takes about 3 hours day hiking. Nagarjun hill station is equally popular to get heart touching view of glittering mountains namely mount Manaslu (8,165m), Ganesh Himal (7,446m), Lantang lirung (7,245m) and many other snow-covered mountains. 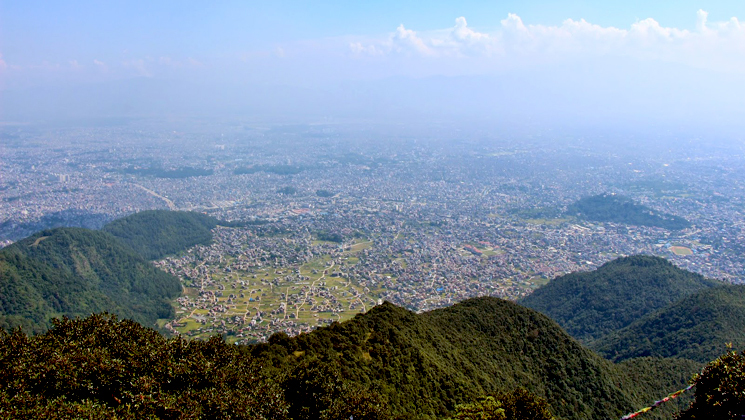 Moreover, you will have also a great view of Kathmandu. Besides that, day tour also provides you with the stunning view of growing Rhododendrons forest on the mountain slopes begin to bloom in February and stay in bloom for several months, giving the village even more charm. Nagarjun forest is a part of Shivapuri national park. Moreover, Nagarjun hill station day hike is also popular for the cycling trip and for Bird watching. Thus, it is an enjoyable journey passing through oak, rhododendron and pine forest. The view that you can see from here is stirring because it unravels the beauties of nature like any other viewpoint and stands head to head with them and has become the most popular viewpoint. Because it is perfect for swallowing the extensive blessing of nature. Being a combination of leisure and cultural, this tour guarantees its visitors for full of fun. Day 1 Nagarjun hill day tour | Nagarjun hill day hiking ! After the pre-trip meeting, your day tour will start at around 8:00 am. You will have a private vehicle and a professional tour guide along with you. Your day tour begins reaching at Balaju national Park entrance check post. Then you can hike up to the Nagarjuna hill station – Jamachowk – return. While on your day hiking, you Walk through the beautiful forests. The journey takes about 2 or 3 hours of walking then the rest of part, you can drive. Majestic views of Kathmandu city, Eye-catching view of Swayambhunath stupa, and some of its heritage sites. Nagarjun hill day tour with college students! 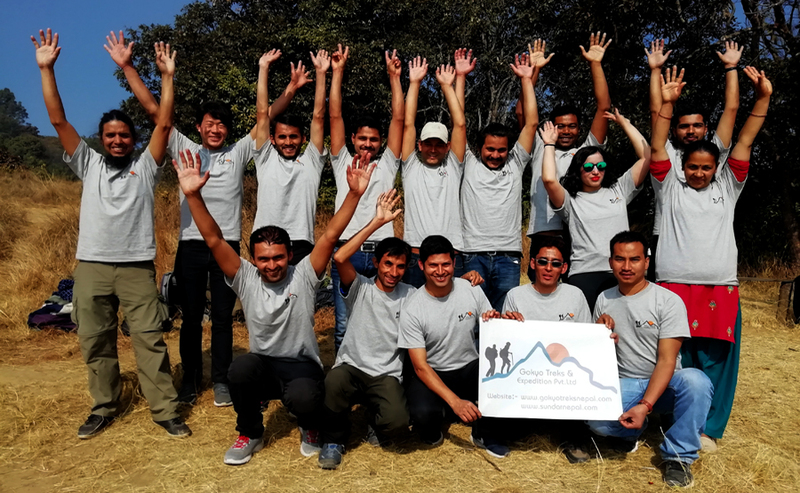 We are a team of 8 people and have booked Nagarjun hill day tour for my college friends with Gokyo Treks and Expedition. From the initial inquiry to the end of the trip the company was very impressive. Ammar – the founder of the company was extremely efficient. He answers all of our emails and messages by return. We were extremely fortunate to have Ammar Guni as our local Tour Guide. They were both extremely kind and always wanted to ensure we were safe and happy. Nagarjuna hill day hiking was just awesome. Their customer service is excellent, so I would definitely recommend and use this company again. – Michael Teschdel, Rudolestadt, Thueringhen, Germany.